Hey, guess what? Vermont is kinda pretty in the fall. Middlebury’s Board of Trustees met a couple of weeks ago. The big news coming out of the fall meeting was the board’s ratification of a new strategic framework for the institution. 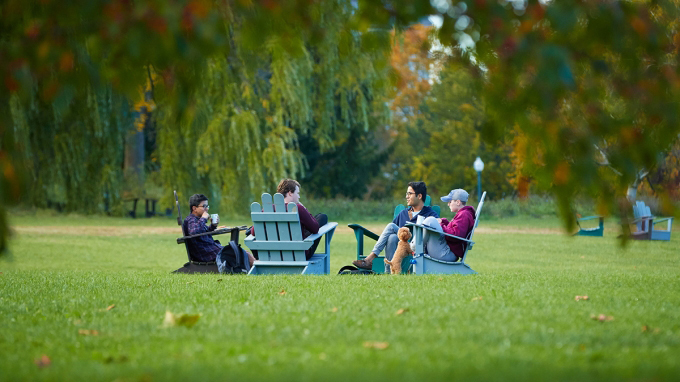 The framework consists of new institutional mission and statements, individual mission statements for each of Middlebury’s schools, and sets of distinctions, strategic directions, and principles that, together, will serve to shape Middlebury’s strategic decision making. A strong equities market helped generate an investment return of 13.8 percent for Middlebury’s endowment in the fiscal year ending June 30, 2017. Thanks to the solid return and to gifts received during the year, the value of Middlebury’s endowment ended the year at $1.074 billion—up $74 million from 2016. Fifty years ago, tens of thousands of people marched in Washington to protest the Vietnam War. One of the marchers was Sharon Smith ’68, and her voice was one of many that informed a fascinating oral history of the moment that was published by the New York Times. It got spooky on campus at Halloween.